Robert Little's Official Website | A "BIG" Name in Education Motivation! 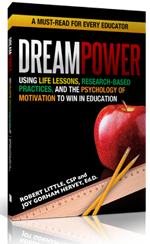 Robert Little's latest book, is a must-read for every educator. Robert Little’s mission is to inform, educate and enhance the personal and professional lives of his audiences. His captivating style of delivery, practical insights, content-filled presentations sprinkled with humor, inspires any audience to take action! Totally convinced that words can change lives, Robert is committed to bringing audiences presentations of substance that offer take-away value. Over the years, he has provided motivational assembly programs, professional development and parent involvement presentations at some 700 schools. He has also keynoted or was a featured speaker at dozens of conferences. Robert has overcome many obstacles to make his dreams come true. Today, he spends much of his time showing others how to do the same. When he’s not traveling the country delivering his uplifting messages, he’s writing from his Atlanta-based home. In addition to his public appearances, Robert has made a profound difference through his literary work. His children’s books have been selected as Accelerated Reader (AR) books, which is a reading program widely used by schools across the country. Additionally, his books have been adopted as “books-of-the-month” at many schools and are used as resources in professional development training.